We’d love your help. Let us know what’s wrong with this preview of Next Question by Drew Rosenhaus. Winning business principles from an NFL super agent— includes photos. Building the most dominant sports agency in professional football—with over $1 billion in player contracts since 2003—Drew Rosenhaus has made a name for himself in the game…by winning. With more active player clients than any other agent in the NFL, Drew and his brother Jason sit at the top of an impress Winning business principles from an NFL super agent— includes photos. Building the most dominant sports agency in professional football—with over $1 billion in player contracts since 2003—Drew Rosenhaus has made a name for himself in the game…by winning. With more active player clients than any other agent in the NFL, Drew and his brother Jason sit at the top of an impressive field. 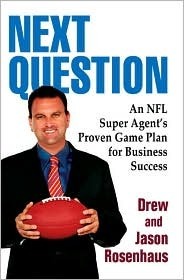 Now these two superstars take readers inside the National Football League to deliver the secrets behind their business success. To ask other readers questions about Next Question, please sign up. Good stories in the book but he REALLY thinks highly of himself and his writing style is extremely annoying. Struggled to power through the end of this one.